A gentle bamboo ramie cloth for exfoliating on one side and a soft cleansing cloth on the other, to leave your skin feeling wonderful. Exfoliating Skin Care. 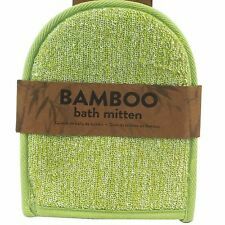 Bamboo Bath Glove. Kitchen Essentials. Ideal for cleansing skin. 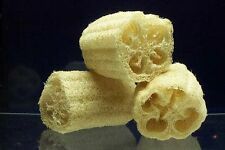 Nom Latin: Luffa Cylindrica = Luffa Aegyptiaca = Luffa pentendra. Originaire de l 'Inde le luffa cylindrica est une plante rampante ou grimpante si on la palisse (elle est pourvue de vrilles). Nom Vernaculaire: Eponge végétale, Loofah, Loofa, Louffa, Liane torchon, Courge torchon, Courge éponge, Courge du Hammam ,Gombo de Chine, Sponge Gourd. Also works great as a shower brush and back scratcher. The 18" Semi-Flexible bendable lotion applicator can bend into a curve for better reach and holds its shape during use.It is light weight and unbreakable! Athena Exfoliating Gloves. Polyester glove has a highly textured surface to gently exfoliate the skin while it increases the lather of your favourite soap or body wash. Plus, it stretches to fit most hands and has an elastic cuff to stay secure. 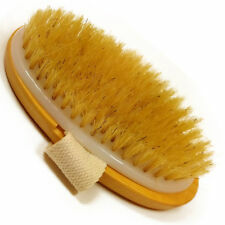 And incredibly soft bristles are only part of what makes EcoTools. Start with your legs, then mid-section, then arms, always brushing in an upward motion. 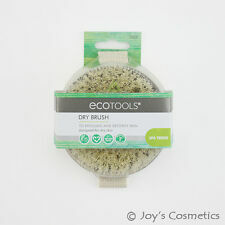 The DRY BRUSH is designed with synthetic bristles to exfoliate and smooth for soft, glowing skin. The looser weave creates plenty of lather and dries quickly which has the added benefit of preventing bacteria from lurking! The natural fibres give skin a soft, smooth glow without being too harsh. 2 Pairs of nspa Exfoliating gloves. Exfoliating gloves from the popular nspa spa experts range. Using gentle circular motions these textured gloves will lift and buff away dead skin cells. perfect for preparing skin for tanning. And incredibly soft bristles are only part of what makes EcoTools. Mask Remover Sponges are made with natural plant pulp to remove facial masks. and exfoliate for cleaner, softer looking skin. Rinse under warm water and gently wipe off facial mask. Al HAMRA PREMIUM MOROCCAN KESSA HAMAM GLOVES. DOUBLE STITCHED. SUPERIOR QUALITY. DOUBLE FABRIC (300D). COLOURS OF WRISTBAND WILL VARY. 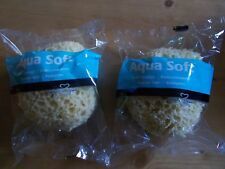 African Bath & Shower Full Nets Bathing Sponge. Add to Favorites. we′re here to help. QUALITY PRODUCTS. PRODUCT SUPPORT & ADVICE. (Mon - Fri). New AXE Detailer 2-Sided Shower Tool, For Deep Cleaning And Making Skin Smoother. You Will Get (1) Detailer. Don't miss out this great deal! Slightly smaller than our Bath sponge. Size 110mm x 35mm. Exfoliating Body Scrunchie. Soothing on skin. Easy to clean and rinse. Use with body wash for a full clean. Kitchen Essentials. Kitchen Disposables. Kitchen Miscellaneous. Kitchen Appliances. BlueCanyon Body Wash Bath Strap Back Scrubbing Exfoliating Loofah With Strings. Exfoliating Loofah Back Strap. Our Mission. Size: approx. 72 x 10 cm. Color: Beige as the picture shown. This mitt is a natural product that is excellent for skin care and exfoliation. To keep the mitt fresh it can be machine washed at 40 degrees C. Ideal for improving conditions such as cellulite, or just to give your skin a healthy glow. 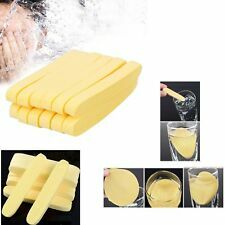 You will receive: 4 pieces Bath Sponges. Works with any type of soap. 2 Nail Brush Double Sided Scrub Toe Finger Clean Manicure Pedicure Tool Plastic. Apollo Plastic Nail Brushes, Set of 2 White. Apollo Plastic Nail Brushes, Set of 2. Double Side brush made with Plastic. Bath brush with wooden handle and oval bristle brushRemove the handle and use it as a hand-held scrub brushEasy-to-grip handle extends your reach to those hard to get places, back for instanceCanvas strap for easy holding, rope hanger for easy hangingMake your bath experience healthy and enjoyable with this bath brushDescriptionThis long handle back brush is specially designed to clean those hard-to-reach spots on your body. Apply liquid cleansing gel or bath cream, then gently brush your body. Rinse and hang to dry after each use to prolong the brush life.Material: Wooden handle, bristle brushTotal Length: Approx. 17 inch / 43 cmBrush Area ( L x W): Approx. 4.5 x 2 inch / 11.5 x 5 cmColor: Wooden colorPackage Include:1 x Bath Brush Brand Unbranded MPN Does n.
The handle is made from FSC Certified Beechwood. After a wet massage, the brush should be allowed to dry with the bristles facing downwards to allow excess water to be removed from the bristle holes. 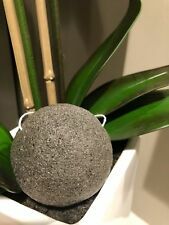 MyM loofah pad exfoliating loofah sponge are made of Loofah material and terry cloth. Natural loofah bath products can effectively remove the dust on the surface of the skin, wipe excess pores in the oil, powder, etc. Excludes Highlands, Islands and Northern Ireland (ask for a quote for any of these places). This particular h.d polyethylene mono thread is water repellent and it does not absorb foul odours and dirt. Order before 11am. 12 Piece Manicure Nail Set. Health & Personal Care. WHY BUY FROM US. Revitale Collagen Eye Patches. Material : PE no netting. 1 x Blue Sponge. 1 x Green Sponge. 1 x Purple Sponge. 1 x Pink Sponge. This is our SOP, for us to be certain and for record purposes. Color : As shown in the picture. REASON so that we can provide RMA instructions.